A shower gel is a simple beauty pleasure, but I’ve always said that simple beauty bits can sometimes bring just as much pleasure as an expensive palette or high-end lipstick. It’s something you (hopefully) use every day and because of that it might as well be something lovely so you step out of the shower feeling perky and refreshed rather than smelling of washing up liquid or generic lemon scented shower gel and with tight, dry skin. 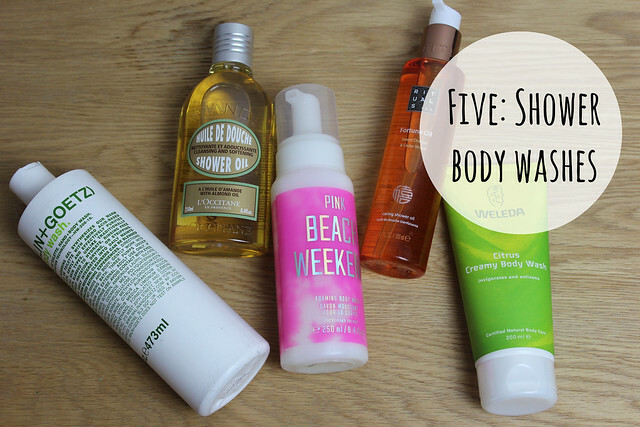 So I picked out five of my current favourites to dedicate a little blog post to. Malin + Goetz Rum Body Wash – Malin + Goetz is a great bath/body range and I absolutely love the stuff they have stocked in the changing rooms at Barrys Bootcamp so the scent of this one will always remind me of intense workouts! Which I need to get back to ASAP! The Rum Body Wash manages to smell both fresh and tasty at the same time – in that odd way that part of you wants to drink it, and the other part bathe in it! Luckily I don’t quite give in to the urge to drink it, that would be a bit foamy and gross. But it does smell great. L’Occitane Almond Shower Oil* is one that I have loved for a long time – it smells amazing and feels really rich and softening to use. It has a properly indulgent to use and just smells absolutely gorgeous. This also comes as a great little duo from QVC that makes it a bit more of a bargain to stock up on than it would be otherwise. One of a few shower treats that I’ve repurchased over and over – love it. Victoria’s Secret ‘Pink’ Beach Weekend shower foam – I picked this up in the Victoria’s Secret sale earlier in the Summer and can’t explain how much I adore the smell of this. It literally smells like the Summer version of heaven in a foam. I cannot stop sniffing this it smells that good. It is quite an artificial scent that not everyone will like, but personally, it really does make me dream of Summer and as the days are getting a little shorter and winter getting closer – this takes me right back to a tropical island in my head. Rituals Laughing Buddha Fortune Oil* – Another new love that I have been getting through at a rate of knots since I first used it. It smells sweet and fresh and a little bit citrussy but mandarin citrus rather than grapefruit. Another oil based shower treat that leave skin soft and silky smooth in a jiffy. Gorgeous stuff and I just love the whole laughing buddha idea – a happy way to start the day. Weleda Citrus Creamy Body Wash* – This is one that I rely on for the more tired mornings where I need a proper wake up call and a bit of a kick up the bum in the morning. I have a feeling that this will be my number one pick in the mornings for up coming London Fashion Week as it’s going to be a little hectic! I really want to try some of thee products..my current love is Molton Brown products. All of these sound so amazing! I want them all! ohh the l occitane almond shower gel sounds like my kind of thing. Might be a good one to try for autumn. The L’Occitane Almond Shower Oil really sounds like a “must try”! 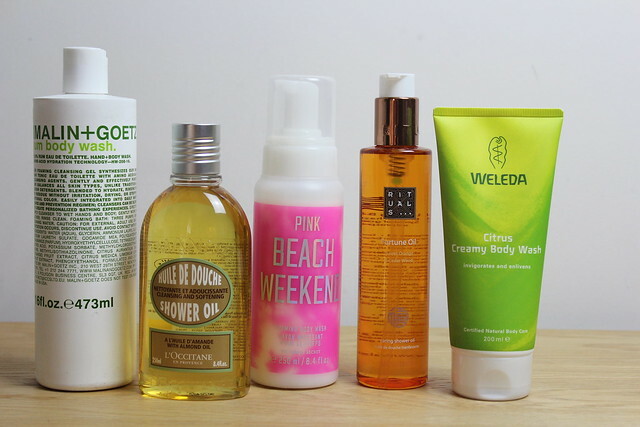 And as I love the Weleda quality I’ll check out the citrus body wash as well – sounds great for after gym use! I love the L’Occitane and have just bought the Laughing Buddha oil. Haven’t found a Rituals product I don’t like yet so I’m expecting to love it!